I love Matzo Ball soup. Some people are very particular about how they want their matzo balls to taste and what size they need to be and how many belong in each bowl etc. For me, this is one food that I always love whenever I have it. I’ve had matzo balls from instant mixes that have been delicious as well as some that came about only after hours of mixing, resting, seasoning, (sometimes freezing! ), simmering, and I love them all. 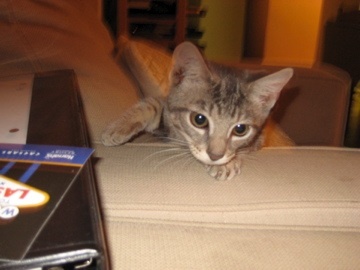 My wife and I foster kittens sometimes for a Brooklyn rescue service. When people ask what kind of matzo balls I like, it’s as if they’re asking me to tell them what kind of kitten I think is the best. They vary quite a bit in appearance and everything else, but they’re all great in their own ways. My grandmother, a superb cook, always said that the stock itself was one of the most important components of the soup. Indeed, you could serve the best matzo balls in the world but if they’re simmered in poor quality stock, the matzo ball’s brilliance will not shine through. So let’s start with the stock itself. I know there is an earlier post about chicken stock, but this is a bit more specific. In the interest of conservation, I’ve decided to use the carcass (as opposed to an entire chicken) when making this stock. Place a chicken carcass in a stock pot along with 2 onions, a carrot, and celery if you have it around. Simmer stock for a few hours. I think 4 hours is ideal but you have plenty of leeway here. When the stock takes on a nice golden color, add 2 very roughly chopped parsnips. Bubby says this step adds a sweetnesss to the stock and she’s exactly right. Particularly, this late in parsnip season when they have so much sugar in them! Simmer for another hour or so. Remove carcass from pot and pick off any remaining chicken meat and set aside. Also, strain out the veggies and reserve. You can cut up new veggies if you think the stock veggies are too mushy but they usually work fine, especially if you’re trying to conserve. Salt and pepper the stock to taste. 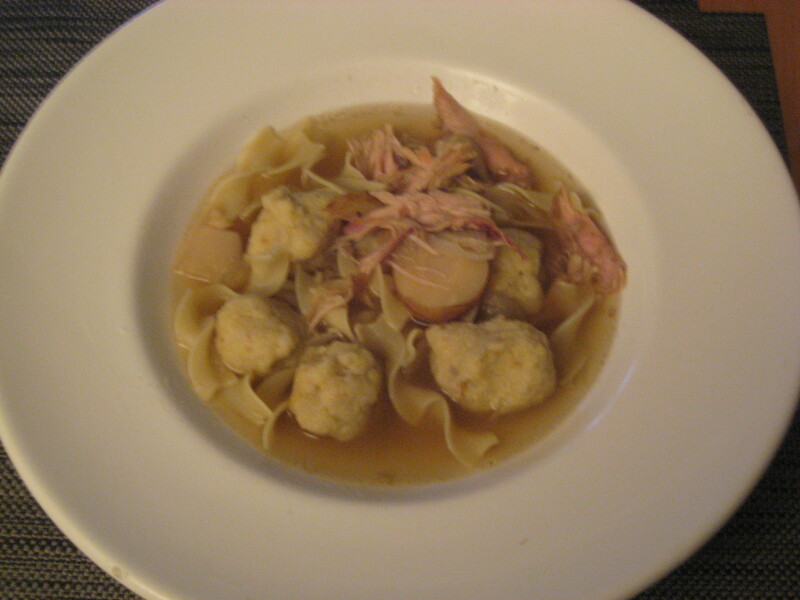 Jewish recipes often call for schmaltz, or rendered chicken fat. For those of you who get squeemish, remember chicken fat is what makes things like chicken wings taste so delicious and is almost certainly part of the matzo balls at really good delis like Second Avenue in NYC. Anyway, I had saved some schmaltz from a local chicken I roasted the week before. I talk often about how much richer pastured chicken meat is (as opposed to the meat of a supermarket chicken), but the fat itself is even more delicious. I’m also using a pastured egg from Tamarack Hollow Farm. There’s a nice write up about them in Saveur. Anyway, once you’re using very good fat and very good egg, you’re most of the way there. You’re missing only, the matzo meal itself. Now this is something I was unable to find locally. If you know of a way to find it in NYC locally, by all means, let me know for next time. Also, I only like tabby kittens. Mix Eggs, fat, stock, salt and pepper in small bowl. When mixture is blended stir in matzo meal. Bring stock up to a simmer. With wet hands, roll matzo balls so they are about an inch in diameter. Bigger or smaller is fine. You’ll get around 6 of them with this recipe. Drop them carefully into simmering stock and simmer for around 45 minutes. While soup in simmering, boil some egg noodles according to directions on package. Add in reserved chicken and vegetables and serve in large bowl. Here’s an idea: The less pleasant you think the next day’s weather is going to be, the more servings of soup you should prep the night before. NYC was hit pretty hard this week by the blizzard. I’m pretty sure it’s one of the first times the city has announced a snow day a full day before the snow started to fall. Similarly, I declared Wednesday ‘Soup Day’ in my apartment. There are several good vendors of beans and grains in the NYC area. I’ve started buying whatever beans are available knowing that they keep for a very long time dry. The local beans taste far richer than most of the supermarket varieties and have a great flavor for hearty, winter dishes. Because of the forecast, I soaked about half a pound of white beans in water overnight. I also thawed around 2 quarts of chicken stock that I had made a few days earlier from a very good chicken carcass from Flying Pigs (They mostly do pork which is good because otherwise that would be an odd name for a chicken farm). I also knew I had a few leaves of collard greens left as well which would add a little color. This is a good soup to add leftovers to. Extra veggies, potatoes, a small amount of meat, or even some fish or shellfish would be great. You might also add a splash of vinegar here for some acidity. If you want, puree the soup and add a drizzle of heavy cream or half and half. Serve with a piece of bread. Stay warm and look out the window.